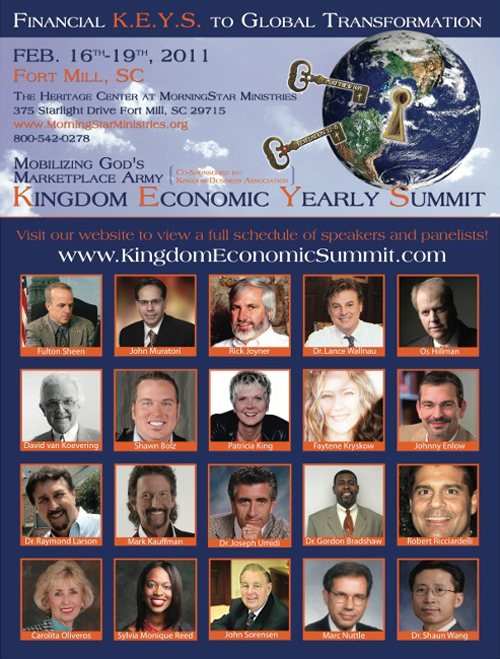 "Marketplace leaders from around the world converge Feb. 16-19, 2011, at The Heritage Center in Fort Mill, SC, at MorningStar for the 4th Annual Kingdom Economic Yearly Summit (KEYS)." Charlotte, NC ? January 03, 2011 - Christian marketplace leaders from 15 nations and 40 U.S. states will gather Feb. 16-19, 2011, at The Heritage Center in Fort Mill, SC, on the MorningStar Ministries campus for the 4th Annual Kingdom Economic Yearly Summit (KEYS), according to Dr. Bruce Cook, Summit convener. "We have many of the top Christian business and financial leaders globally coming together to offer strategies and solutions for the marketplace and the economy," adds Cook, also President of Venture Advisers Inc, Kingdom House Publishing and Kingdom Ventures. The Kingdom Business Association is sponsoring the event and this year's theme is "Mobilizing God's Marketplace Army." There will be 80 speakers and presenters in total for the general sessions, breakout sessions, workshops and roundtables, plus there will be worship, networking, exhibitors, meals and ministry available. "This will be our biggest event yet," says Cook, "and we expect attendance of between 1500 and 2000 people plus the live webcast audience."